Damascus Synthesis Material in Kingdom Hearts 3 is an important material you have to get in the game. Mostly, you can find them in chests hidden around the major worlds. These include Mostropolis, Arendelle, The Caribbean, and others. But, there’s also a few ways to earn even more KH3 Damascus in space, using your trusty Gummiship. Our Kingdom Hearts 3 Damascus Locations – Where to Find Material guide will show you the different locations where you can find Damascus in the game’s main worlds, as well as how to get even more from space with the Gummiship. Where to Find Damascus Synthesis Material in Kingdom Hearts 3 Kingdom of Corona? To find the KH3 Damascus synthesis material in the Kingdom of Corona, there are several places that you can visit. To get to the first one, go to the fourth save point in Corona, called The Forest: Campsite. Go down the canyon to the south, and keep your eye out to the left. You’ll find a wall that you can sprint up, and there’s a chest on a ledge up there. Open it, and you’ll find the Damascus. The second Damascus location in the Kingdom of Corona is a little harder to find. Start at the fifth save point – The Forest: Wildflower Clearing. head to the southwest, through the canyon, until you reach a clearing. Look to your right, and you’ll see a small group of shrubs on top a small cliff in the distance. Make your way up there, and climb up the wall behind the shrubs. Follow the path until you reach a hole. Look below, and you’ll notice a platform with a chest, which holds the Damascus. To find Damascus locations in Monstropolis. the first place you need to go to is the fourth save point, aka The Factory Ground Floor. Head to the right, around the yellow elevator. Run through the room with the yellow canisters, and follow the corridor up the stairs on the right. Keep going until you reach the next large room. Head down the stairs and go right, towards the giant door marked E6. Look at the corner to the right of the E6 door to spot the chest with the Damascus. For the second Damascus in Monstropolis, go to the save point by the name of The Power Plant Tank Yard. Turn around and grab the hook to get to the upper level. Then, use the airstep to reach the top of the giant chimney. Follow the catwalk to the left, around and down the chimney. Walk down the short staircase and turn right as soon as you can to see the chest with the Damascus. Damascus Synthesis Material Arendelle – Where to Find? To find Damascus in Arendelle, aka the world of Frozen, your first target is the North Mountain Treescape fast travel point. From there, go all the way to the north of the clearing, and head down the narrow path. Keep your eye on the right. Just as the path is about to reach a small opening, you’ll notice some snow-covered plants. The small purple chest is behind those plants, and the Damascus is inside. The second Damascus location in Arendelle is super-easy to find. Start from the save point called The North Mountain Gorge. Walk into the huge blue portal staring you in the face. This will transport you into the Labyrinth of Ice. Don’t worry, you won’t have to go through the maze. As soon as you arrive into the labyrinth, there will be two chests you can open. The one on the right holds Damascus. The third place where you can find Arendelle Damascus in Kingdom Hearts 3 is near the save point called The North Mountain Foothills. Walk towards the red line on the map, and this will transport you to the Foothills area. Keep heading north, and keep your eye on the right. Soon enough, you’ll see a wooden cart with some boxes on it. The chest with the Damascus is right next to it. San Fransokyo Where to Find Kingdom Hearts 3 Damascus? To find Kingdom Hearts 3 Damascus in San Fransokyo, the first place you can visit is The City South District save point. We went by day, but I don’t think the time of day is of any importance. From there, go around the building behind you on the left. As the Asian Food Festival poster comes into view, keep your eye on the left. There’s a chest in the corner that will net you Damascus. The second Damascus location in San Fransokyo is really well-hidden. First, start off from The City South District fast travel point. Run across the street to the ramp in front of you, and jump onto the railing to ride it. Keep going until you reach Central District. Just before the road turns left, jump off to the right, in the direction of the yellow Radio 5F sign. Land on the ground in front of the Fish Grill, and go into the alley next to it. Turn right, and you’ll spot the chest at the end of the alley. The first Damascus material location in The Caribbean was from the High Seas: Huddled Isles fast travel point. Jump onto your ship, and set sail for Horseshoe Island. When you arrive there, go ashore, and explore the southwest part of the beach. The chest with the Damascus is hidden behind a rock, among a bunch of crates and barrels. The second Damascus chest in The Caribbean is on Isla de los Masitles, so sail there. Run up the wall on the left of the cave entrance. Follow the path forward; you’ll have to jump across some stone pillars to get across a chasm. After that, take a few steps, and drop down the other side, and into a small lake below. There are a few chests down there, and the one on a large, flat rock is where the Damascus is hiding. Damascus location 3 in The Caribbean is on Sandbar Isle, so get on your ship and travel over there. Hop off the ship and fly over the island. You’ll notice one huge rock jutting out of the water that has a few barrels stacked on top of each other. Dive into the water next to this rock, and look for the chest. It’s hidden among some seaweeds. How to Get Damascus KH3 Synthesis Material with Gummiship? The first location where you can earn not one, but three Damascus on your Gummiship is by playing the minigame with the huge, gold orb that’s floating to the left of San Fransokyo planet, in the Misty Stream “galaxy”. Mark the orb, then scroll to San Fransokyo, and hit Embark from Here (triangle on PS4). Follow the marker, and shoot the gold orb. Now, it’s time for the minigame. The goal is to shoot the cogs on the orb to turn them, so that all the gray areas turn yellow. It’s pretty simple, but it might take you a few tries. It’s worth the trouble, though, because you get three Damascus and a bunch of other stuff for completing the minigame. The second location is more for farming, really. It’ll require you to shoot a bunch of asteroids straight out of space. All of them will grant you something useful, and there’s a good chance that Damascus will be one of them. Anyway, scroll to the Keyblade Graveyard in The Eclipse “galaxy” in the World Map, and select Embark from Here. Facing the huge space station, turn right, and you’ll see the asteroids you need to shoot glowing blue. 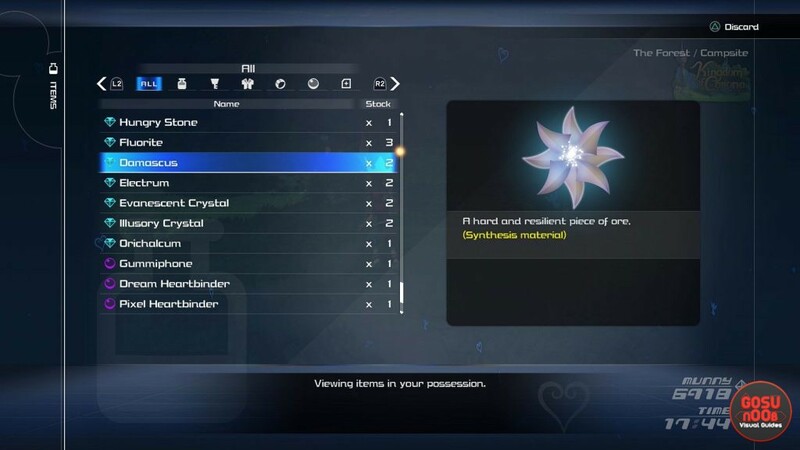 So, those are some of the places where you can find the Damascus synthesis material in Kingdom Hearts 3. We might have missed some of them; feel free to tell us of other potential locations in the comments. If you need help finding another material, check out our other guides on the subject, including Fluorite Locations, Orichalcum Locations, and Wellspring Crystal.